How Do You Spell LONDON? 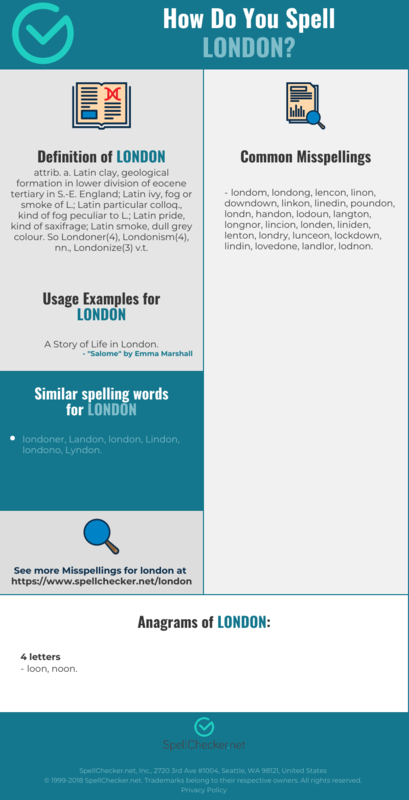 Correct spelling for the English word "london" is [l_ˈʌ_n_d_ə_n], [lˈʌndən], [lˈʌndən]] (IPA phonetic alphabet). 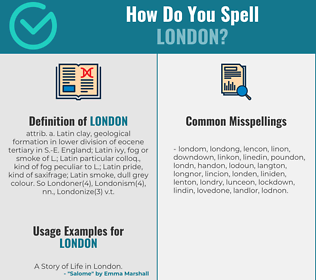 Below is the list of 226 misspellings for the word "london". attrib. a. Latin clay, geological formation in lower division of eocene tertiary in S.-E. England; Latin ivy, fog or smoke of L.; Latin particular colloq., kind of fog peculiar to L.; Latin pride, kind of saxifrage; Latin smoke, dull grey colour. So Londoner(4), Londonism(4), nn., Londonize(3) v.t.